GRAFENWOEHR, Germany — The European Parent Teacher Association hosted the 37th annual EPTA Regional Spelling Bee Feb. 23 at Ramstein Elementary School on Ramstein Air Base. The event featured 25 local spelling bee champions in grades 3-8 from Department of Defense Education Activity – Europe schools in Germany, Italy, Spain, the Netherlands, Turkey and the United Kingdom. 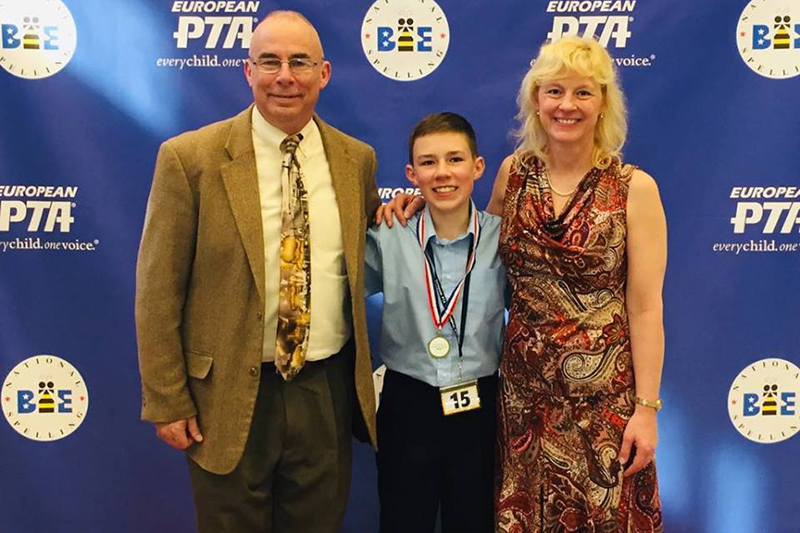 This was Robert’s third appearance in the EPTA Regional Spelling Bee, representing Grafenwoehr Elementary School in 2017 and Netzaberg Middle School in 2018 and 2019. He clinched his victory by correctly spelling the word ‘quaff’. Now he’ll be moving forward to compete against champion spellers from across the United States in the Scripps National Spelling Bee May 26-31 at the Gaylord National Resort and Conference Center outside Washington, D.C. The garrison was also well-represented in this year’s Bee by fourth-grader Catalina Campos of Garmisch Elementary/Middle School, fourth-grader Madeline Sword of Grafenwoehr Elementary School, fourth-grader Khalista Abbey Talingdan of Hohenfels Elementary School, and fifth-grader Connor Knazovich of Netzaberg Elementary School. In addition to his Champion’s medal, Robert will receive several prizes, including a 2019 U.S. Mint Proof Set, a one year subscription to Britannica Online Premium from Encyclopaedia Britannica, and a Merriam-Webster Collegiate Dictionary (Eleventh Edition). Robert will also receive travel and lodging expenses from European PTA for himself and a parent or guardian at the 2019 Scripps National Spelling Bee and a one year subscription to Merriam-Webster Unabridged Online. That online dictionary subscription will come in handy, because that’s his study list for the national competition.